Founded in 1425, KU Leuven bears the double honor of being the oldest existing Catholic university in the world and the oldest university in the Low Countries. KU Leuven is a research-intensive, internationally oriented university, strongly inter- and multidisciplinary in focus. The Media Lab of the Institute for Cultural Studies (CS/Digital) at the Faculty of Arts, specializes in e-learning for the Humanities and digital cultural heritage. It has run several projects involving the innovative use of digital images in Humanities education. Moreover, the photo lab of the Faculty of Arts hosts the dArts digital photo repository, which currently holds over 375.000 digitized images with high-quality metadata. The University Library houses a photo lab as well: the KU Leuven Digital Lab, a center of expertise in digital imaging that is involved in high-end digitization, art-technical imaging and visualization. The images provided to EuropeanaPhotography stem from the KU Leuven Library’s holdings; along with the other collections and organizations involved in the project, these treasures will be featured in a dedicated issue of CS/Digital’s own peer-reviewed academic journal Image [&] Narrative. img. 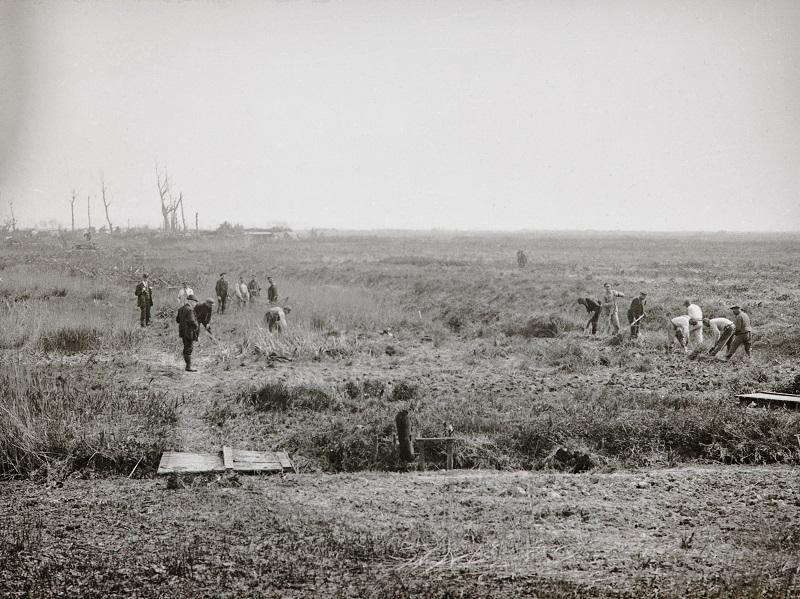 Men restoring the devastated land after World War I, Westhoek (Belgium), after 1914. Collection Verwilghen © KU Leuven.